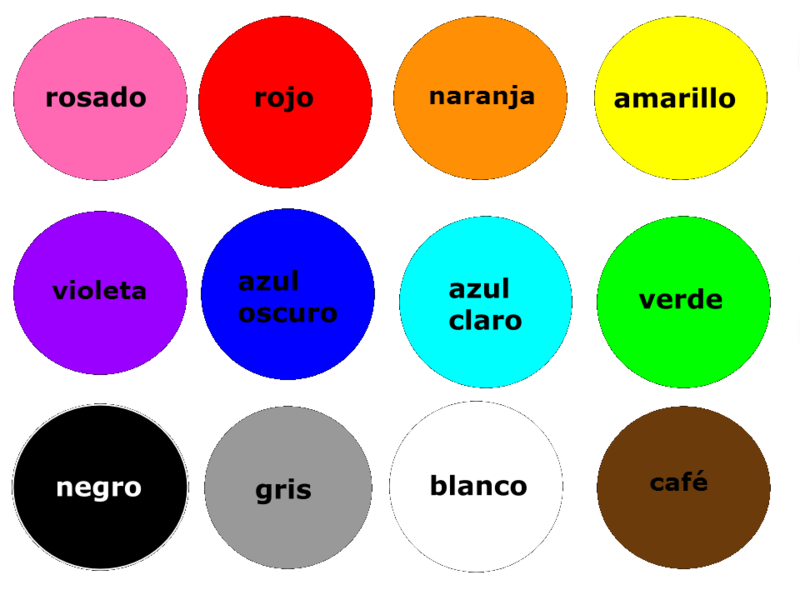 Look at your colored pencils or crayons, and you'll probably see the color words written in Spanish. You may find that some color words match those above, and some others match the words below. To ask and answer the question of what your favorite color is, see below. What's your favorite color? ¿Cuál es tu color favorito? Ask your desk partner what their favorite color is. The word for pink - rosado - comes from the word for rose - rosa. The word for orange - anaranjado - comes from the word for orange (the fruit) - naranja. One word for purple - morado - comes from the word for blackberry - mora. Another word for purple -violeta - is also the word for violet (the flower). One word for brown - café - is also the word for coffee. ¿De qué color es el sol? Es amarillo. To ask what color something is, ask ¿De qué color es? What color are they? ¿De qué color son? They are red. Son rojos. ¿De qué color es el pez? What color is the fish? What color is the frog? 1. If you're describing someone or something feminine, the color word can't end in -o. Change -o to -a. 2. If you're describing several things, add -s or -es to the color name. ¿De qué color es la perra? What color is the dog (feminine)? What color are the tomatoes?